A term established by David Meerman Scott in 2011, “newsjacking” is the act of leveraging breaking news to draw eyes to your organization and cause. To give you an example, a recent newsjacking phenomenon came from the release of the wildly popular gaming app, Pokémon Go. In the app’s first few months, it was downloaded 500 million times. In fact, the app had more downloads in its first week than any other app sold on Apple’s app store. Such instant success quickly made the app the center of conversations online. You may have noticed several organizations unexpectedly writing about the game and interjecting their own thoughts on how it could apply to the reader—aka­—newsjacking. With the right newsjacking strategy, your organization can use your own blog and social media channels to become a source your community looks to for timely information and commentary. After all, 62 percent of U.S. adults get their news from social media. Below, we’ve outlined how you can craft your strategy, examples of when newsjacking works well, when it falls flat, and when it’s inappropriate. While the practice of newsjacking can secure media attention for your organization and raise awareness for your cause, it’s important to proceed with caution. If the stories you use do not have an obvious connection to your work, you can confuse your audience and even discredit your organization in the eyes of your readers. Don’t propagate inaccuracies. When in doubt, don’t post. Don’t set unreasonable expectations around newsjacking. Set SMART goals around expanding your audience. According to David Meerman Scott, newsjacking is less effective past a certain point in a story’s lifecycle. The longer you wait to contribute to the discussion, the more voices you’ll be competing against. If you react to breaking news quickly and are among the first few to respond in a creative or clever way, you’re more likely to gain attention. But what does quickly really mean? Small Business Trends warns against waiting more than a few hours after news initially breaks. However, HubSpot notes that it can be appropriate at times to write a piece after news has passed. They use the example of a “fashionably late deep analysis” to suggest that you can also “win” by having the most thoughtful and creative contributions to the discussion. When Does Newsjacking Work Well? Newsjacking that’s done right often educates the reader in a creative way, while elevating the organization’s brand. It can also be an opportunity to show off your organization’s personality and delight your supporters. This iconic tweet by @Oreo is lauded as a perfect example of well-executed newsjacking. When the power failed at the 2013 Super Bowl, Oreo chimed in on the news just minutes later. Their clever message was a huge hit, later publicized as beating out all of the televised ads that year. When Should I Give Newsjacking a Second Thought? If you’re struggling to draw a connection to the news you’re jacking, chances are you shouldn’t jack said news. When you attempt to use a piece of news that seems irrelevant to your brand, you risk confusing your audience and diluting your voice. When Prince George was born in 2013, several companies had social media posts ready to celebrate. Some were clever and cute…and some missed the mark. @Chobani’s tweet confused many and while it did get attention, it was the wrong kind. Many commented in dismay and asked why the brand had tried to contribute to the news discussion at all. When Should I Pump the Brakes on Newsjacking? Some cases of newsjacking can appear plain deplorable. In a matter of moments, an ill-conceived newsjacking attempt can dismantle your organization’s reputation and swear supporters off of your brand forever. 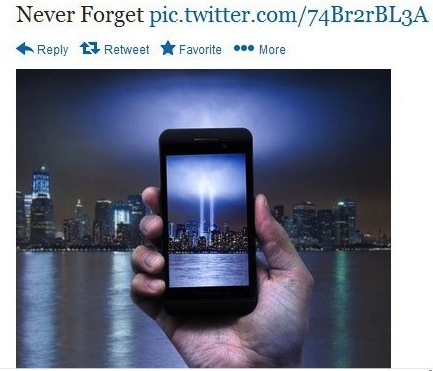 This image posted in 2013 meant to honor the lives lost on 9/11. However, the image used to honor the tragedy was viewed as a marketing ploy for a product. Hundreds responded in outrage and disgust. The tweet was deleted and AT&T issued an apology, but the tweet had already damaged their reputation and caused followers to question their moral standing. To avoid this type of newsjacking, you can create a list of questions that your team needs to answer before they move forward with a story. If the answer to any of the below questions is, “yes,” do NOT proceed with the newsjacking idea. You run the risk of tarnishing your brand and destroying your organization’s reputation. Could the point that we’re making be misconstrued? Might this newsjacking offend anyone? Could this negatively impact someone’s first impression of our brand? Are we “trying too hard”? Does the story elevate our brand at the expense of another’s misfortune? Newsjacking can be a great tactic to contribute to timely discussions around recent stories. If you develop a system for gut-checking your content, you can use this content marketing strategy to develop your brand’s voice and raise awareness for your work. Has your organization tried out this content marketing strategy? We’d love to hear about your results in the comments below.